A man who tried to kill his GP with a crossbow has been jailed for 20 years. Mark Waterfall, 46, blamed Dr Gary Griffith for the death of his father days before the attack last July. He told the GP, "You killed my father, I am going to kill you", minutes before he shot him at Suthergrey House Medical Centre in Watford. Sentencing Waterfall at St Albans Crown Court, Judge Stephen Warner said it was only by "pure good fortune" that Dr Griffith survived. The court was told the crossbow arrow would have been travelling at a speed of 187ft (57m) per second before it hit the GP in the stomach as he sat at his desk. He only survived the attack, on 10 July 2018, because it was a warm day and layers of fabric from his untucked shirt helped to lessen the impact. Judge Warner told Waterfall: "You fired the bolt into his abdomen from a distance of about 5ft. When you did, you intended to kill him. "It was pure good fortune that you didn't succeed." Five days before the attack, Waterfall's father, Terence, went to see Dr Griffith to complain of breathlessness. The GP arranged for fluid to be drained from his patient's right lung in hospital, but it was discovered he had lung cancer and he died the following day. Before Waterfall was sentenced, a statement from Dr Griffith was read out in court. In it, he told how he had suffered severe nightmares since the "calculated" attack and no longer felt safe at work. 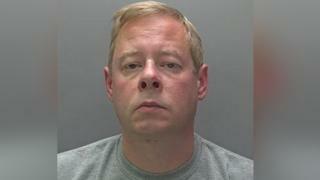 At the start of his trial, Waterfall, of Fairhaven Crescent, South Oxhey, admitted wounding Dr Griffith with intent. He was handed an extended 25-year jail sentence after the judge concluded he was a danger to the public. The custodial element of the sentence is 20 years, of which he will have to serve two thirds before being considered for parole.